WHEN: Sunday, May 4th , 2014 from 12pm-4pm. 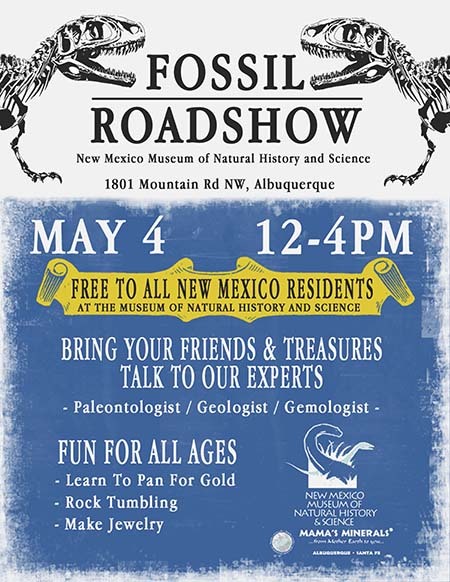 OTHER INFO: In partnership with Mama’s Minerals, and the Albuquerque Gem and Mineral Club, the New Mexico Museum of Natural History & Science announces their Second Annual Fossil Roadshow! Come meet the Museum’s curators as they bring out never seen before fossils from their collection, talk to them about their famous dinosaur discoveries, bring in your own discoveries for identification, make jewelry with Mama’s Minerals, pan for gold, crack open an geode and more! At the Museum’s Fossil Roadshow, kids of every age will find over 15 activities.